Mr Slush is a premium slush brand which has taken the UK slush market by storm. Our committment to manufacturing only the highest quality slush syrups while delivering exceptional service to our customers is the mission of our business. Selling slush drinks is hugely profitable so offering your customers the best product available will keep them coming back for more and your tills busy. Follow us on Pinterest. Our Mr Slush range is available with 15 delicious flavours to choose from, all made using high grade food ingredients and real British sugar. With a high yeild of of 140Ltrs from each case of slush, our water to syrup ratio is 6 to 1. Whether your looking to buy Blue Raspberry and Strawberry slush or are tempted by other syrups such as Lemon and Lime, Sour Apple, Pink Bubblegum or Sour Cherry, you can be assured all our recipes offer on the highest quality. Our drinks will retain its flavour and colour to the last drop. Our Mr Slushed range of frozen ice cocktail slush concentrate mixes are unmatched in the UK. 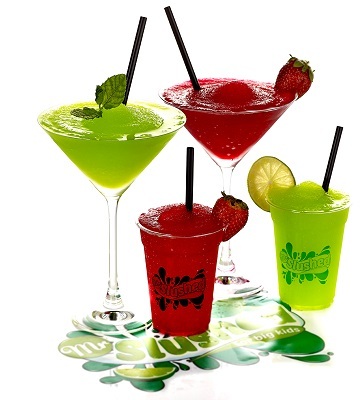 Manufactured using a complicated 2 step process and again using the finest food grade ingredients, the Mr Slushed brand offers Margarita, Strawberry Daiquiri, Pina Colada, Champagne, Lime Daiquiri, Lager & Line and Energy. Simply pour the Mr Slushed cocktail slush syrup into your slush tank, add the spirit of choice and top up with fresh water. Slush Syrup There are 17 products. Our new range of no added sugar slush syrup. Same tasty flavour but without the sugar. Available in Blue Raspberry and Strawberry. Mr Slush 99% Fruit™ slush syrup with a ratio of 6 to 1. Healthy option with no added sugar and one of your 5 a day. Choose from Strawberry, Apple & Blackcurrant, Orange & Mango and Tropical. Mr Slush 99% Fruit™ slush syrups come in boxes of 2 x 5 litre tubs. With a water to concentrate ratio 6 to 1, the cases have a yield of 340 - 360 healthier slush drinks and costs 14p per 200ml portion or 19p if you include the cost of the branded slush cup and straw. Choose from 4 delicious healthier slush drink flavours.